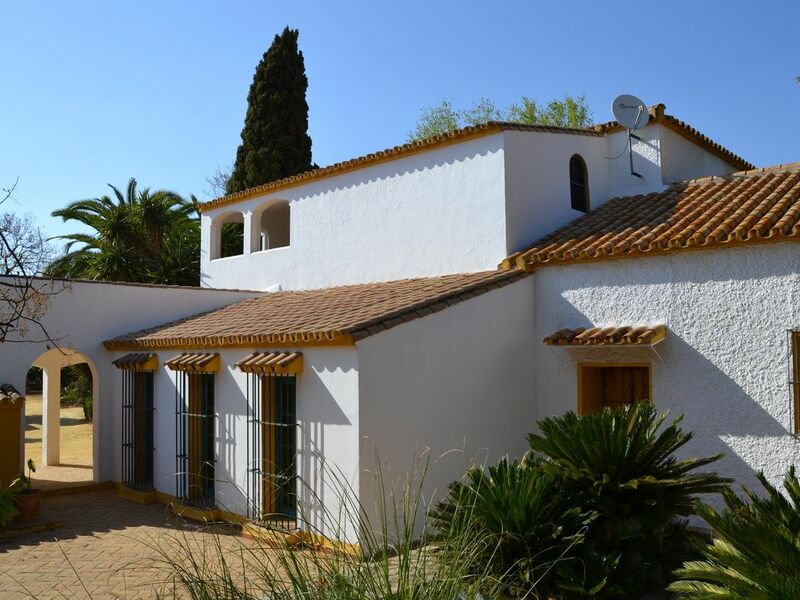 The well kept carefully renovated building is located in the midst of a 9 ha olive and orange tree plantation. There are 5 bedrooms with 7 beds in a 2 story house. It also has a shady garden and a large pool. The service is taken care of in part by a caretaker couple. Further Details: Peaceful and quiet, good working place in a wonderful surrounding. We spent a beautiful week in this villa. We are a family with 4 children and had a fantastic time in the pool, which was kept in excellent condition by the caretaker. The description of the villa does not do it justice, it was extremely spacious, the showers/bathrooms were exceptional with plenty of hot water and the day bed a massive hit with the children. Possibly the biggest bonus is the housekeeper who comes every day to clean and do beds. Also the fresh orange juice is out of this world. Be warned there is little to do, no TV, no internet for us this was a bonus as that meant a lot of family time. The airport is just down the road, the local towns have everything you need, Seville is 20mins drive and best of all proper sunshine. All in all a perfect get away, will certainly be returning sometime soon. Thank you, Sally, for the very kind evaluation. Our aim was always to keep the Huerta Timoteo generous but simple and authentic. For example, good shutters and thick walls instead of air conditioning. By the way - one might get TV: our caretaker will be happy to lend his second TV unit. But we quickly found out, no TV in summer vacation makes much better mood. Exactly what you told us now. We were coming to Spain for the wedding of a friend and wanted to take a few extra days to get some sunshine and catch up on some R and R. This place was ideal, not too far from the airport and nestled amoungst orange and olive trees with a lovely cooling swimming pool. The house keeper was there to greet us on arrival and everything was as described on these pages. We were quickly made to feel welcome despite our appalling Spanish we were able to communicate what we needed etc. She came every day to clean the house which made us feel very lazy but spoilt, she even did some washing for us which was above and beyond the call of duty. Someone also put out fresh oranges for us most mornings which really was a joy. Fresh orange juice everyday... delicious. The house was as described (fairly comprehensive description from the owner), with plenty of room for 6 of us. Everything was tidy and clean. Towels and bed linen were all supplied. Plenty of hot water for showers etc, beds were possibly a little hard but we weren't too worried as much of the day was spent sleeping by the pool! The top floor was a little warm at night - to be fair it was 40 degrees outside but fans were supplied which made quite a difference. My only real negative (if you can call it that) is that a couple of the sun loungers were a little past their prime. Not a problem if there are only four of you but a couple of us ended up lying on the floor by the pool but I can't really say it was a hardship! We were given very good notes on what to see and do around the villa, I would recommend a trip to Carmona and Seville. The local town is difficult to negotiate and we ended up not eating there. This may just have been bad planning our part. Seville is amazing and Carmona is a must see. We ended up eating out in Carmona for most nights as the restaurants are lovely and sitting out on the balcony at the Parador is breathtaking. I was impressed by how much the owner had thought about what the guests might like and any questions we might have had were answered in the extensive notes. Brilliantly organised. I would definitely recommend this property to other people, we had such a lovely time. It really was such a treat to lie by the pool - it was clear that a lot of effort went into keeping the place clean and tidy. Everyone was very friendly and the house was clean and well stocked. A good find, we would definitely stay again. Bereits zum fünften Mal in Folge waren wir dieses Jahr Mitte bis Ende August in der Finca. Wir sind eine Familie mit drei Kindern zwischen drei und neun. Das Haus ist sauber und mit allen wichtigen Dingen des Haushaltes eingerichtet. Luxuriösen Schnickschnak sucht man aber vergebens. Die nahegelegene Kleinstadt Mairena bietet alles, was zum Leben benötigt wird. Wer wie wir gerne Erholung und Kultur kombinieren möchte, ist in der Finca bestens aufgehoben. Der Entspannung dient der ungewöhnlich große Pool, der in ein Pflanzenmeer von Feigen, Zitronen und Orangen eingebettet liegt, aber auch der großzügige Garten mit Rasenflächen. Die Gegend bietet neben der Weltstadt Sevilla weitere zahlreiche Sehenswürdigkeiten (Carmona, Écija usw), aber auch das Meer ist in zwei Stunden gut zu ereichen. Zum Haus gehört ein Verwalterehepaar mit einer Tochter, die zwar auf dem Geländer der Finca wohnen, aber in einem eigenen Haus in gebührenden Abstand. Für uns war ihre Anwesenheit immer beruhigend und Antonio hat uns mit so manchem Problem weitergeholfen (z.B. bei einem Totalausfall der Elektronik unseres Mietwagens). Marie-Carmen sorgt täglich (mit Ausnahme des Sonntag) für die Sauberkeit des Hauses, bezieht die Betten, wäscht das Frühstücksgeschirr usw. Die großzügige Finca ist für alle zu empfehlen, die keine Lust auf Massentourismus haben und lieber Land und Leute authentisch kennen lernen wollen. Wir haben uns immer sehr gut erholt und zugleich das gute Verhältnis zwischen und Preis und Leistung geschätzt. We have stayed at Heurta Timoteo twice in the last 4 years and consider it to be an ideal holiday home in a fantastic location. The property itself is very spacious and light, with a large, airy hallway & separate lounge with an open fireplace, a fantastic dinning room (the most beautiful, rustic dining table I have ever come across), and a simple but absolutely practical, clean kitchen. We always tended to eat meals of local meat (often barbecued by the pool), salads, fruit and cheeses outside, either in the shade of the large walnut tree on the patio, outside the kitchen to the side of the villa or on the outside dining area, by the patio doors which opens to the rear lawn and gardens. - a second downstairs (a mini suite) with a double room and one single bed / cot area and bathroom (which friends or parents have used). There is also a separate shower room and loo downstairs. The grounds around the property are stunningly beautiful and the large, outside swimming pool, shaded areas, sun-loungers and BBQ have always suited our purposes ideally. This place is rural with the surrounding fields of olive, orange, lemon & fig trees complementing the traditional house and 'insulating' one from neighbours and noise. The casero Antonio and his wife, Mari-Carmen, who live in a separate house in the grounds are around to help with some house-keeping and to tend the finca, but are lovely people & never intrusive. Location: Timoteo is about 20 mins drive from Seville Airport and around 30 - 40 mins drive into Seville city centre which is one of the most stunning cities in the world. Closer by is Mairena del Alcor, a small town where small restaurants, supermarkets and other local services are to be found. As we have been to Heurta Timoteo twice already and plan to go again in 2012, we clearly rate the place as a great holiday spot. The property is not luxuriously appointed, but it is very comfortable, clean and superbly located. It is ideal for families and easily large enough to share with friends or family. Sun, countryside, fresh food, wine and a pool. What more could you ask for? Das Haus wurde in den Jahren 1989 bis 1991 zur Gänze stark umgebaut und renoviert. Das Haus unserer Angestellten + Garage und Lager vollständig neu gebaut. Insofern sind die Matratzen wie der Umbau etwa 20 Jahre alt - bei einer jährlichen Benutzung von rund 18 Wochen kommt man auf eine Nutzung von 7 Jahren; kein Grund zur Erneuerung. Die Wäsche wird regelmäßig durchgesehen und erneuert. Unsere Mari-Carmen hatte neue noch originalverpackte Wäsche angeboten; kein Anlass für einen Kauf. man auf keinen Fall die vereinbarte Woche antreten wollte. Für die Semana Santa - die Vor-Osterwoche - waren leider schwere Regenfälle angesagt, was dazu führte, dass sogar - erstmals seit 1933 - die große Osterprozession buchstäblich in's Wasser fiel. Es wurden 80 Liter Regen gemessen; äußerst ungewöhnlich für diese Jahreszeit. Für unsere Angestellten war dies der Grund für die Ablehnung. Wir können uns den Frust angesichts der vorhergesagten Wetterlage gut vorstellen; aber verantwortlich für den Platzregen können wir nicht sein. 25 km from Seville towards Cordoba, near Carmona. Very green, lots of plantations in the area. Die Mietpreise beziehen sich auf bis zu 4 Erwachsene und jeweils auf die erste Woche. Sonderpreis (z.B. bei Belegung nur mit zwei Personen oder Verlängerungswochen) bitte beim Vermieter anfragen. Mindestmietzeit 4 Nächte. Bei Verlängerungswochen reduziert sich der Wochenpreis um 10 %. Bei 5 - 7 Personen (Maximalbelegung) Zuschlag von 20 %. Kinder unter 6 Jahren sind frei. Preis für 2 Personen auf Anfrage.